"Oh, Magoo, You've Done It Again!" Los Angeles, CA - Shout! 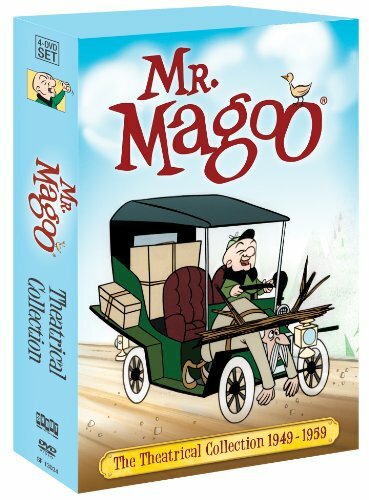 Factory will release The Mr. Magoo Theatrical Collection (1949-1959) in a 4-DVD set on April 22, 2014. This special collector's edition brings together for the first time on DVD all 53 theatrical cartoons, including 12 cartoons in anamorphic widescreen for the first time, and the feature film 1001 Arabian Nights, all in one deluxe collection. Also included as a special feature is the vintage documentary A Princess For Magoo: The Making Of 1001 Arabian Nights, an interview with film critic and historian Leonard Maltin, a documentary on UPA & Mr. Magoo, and 14 commentaries. All shorts have been newly remastered in their original theatrical aspect ratios. Mr. Magoo has bumbled his way to good fortune for more than six decades. His endearing misadventures in everyday life and his stubborn self-confidence have entertained generations. Voiced by the multitalented comedic actor Jim Backus (Gilligan Island), Quincy Magoo or simply Mr. Magoo, is a wealthy, short-statured retiree who gets into a series of sticky situations as a result of his nearsightedness and his stubborn refusal to admit the problem. Mr. Magoo was an instant hit and went on to become a classic animated character starring in two Academy Award(R)-winning theatrical shorts, three television series and two television specials. Grammy(R) is the registered trademark of the national Academy of Recording Arts & Sciences, Inc. Academy Award(R) is the registered trademark of the Academy of Motion Picture Arts and Sciences. These Mr. Magoo theatrical cartoons are under license from Sony Pictures Home Entertainment. * A documentary on UPA & Mr. Magoo featuring the people listed above that did commentaries.